FCC Commissioner Brendan Carr sees first-hand how high-speed broadband allows cattle producers to market their livestock to people across the nation. "The FCC is very focused on trying to close the digital divide and give everyone a fair shot at next generation connectivity," Carr said. "Being in Culpepper County really brought home to us the economic opportunity that broadband can enable, whether it's running a business or an online cattle auction." 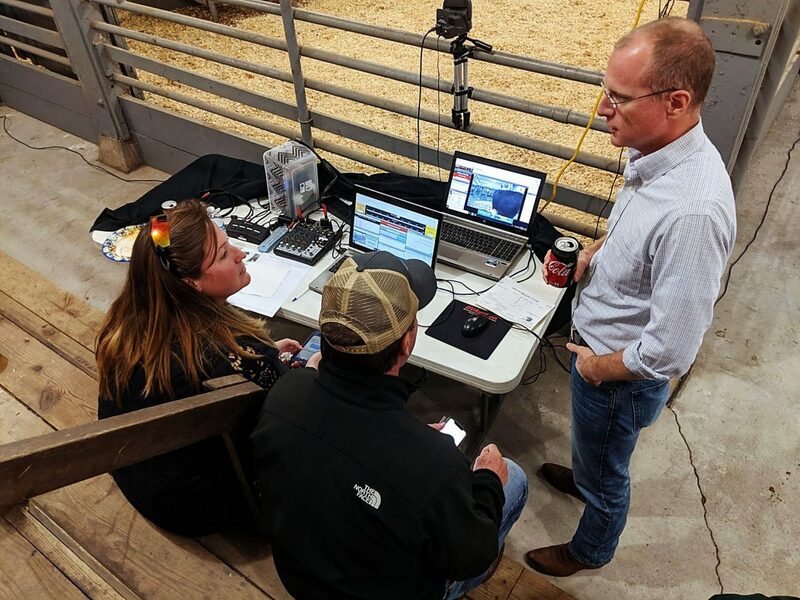 While at the auction, Carr, and his policy adviser Evan Swartztrauber, spent time with individuals who were working the sale and discovered how broadband was a critical component to running the cattle auction. Carr and his team had met with representatives of the United States Cattlemen's Association during the organizations annual fly-in, where they discussed the existing hurdles rural America faces in regards to accessing high-speed broadband service to their communities. "Closing the digital divide between rural and urban areas is an issue of vital importance to U.S. cattle producers," said Lia Biondo, USCA policy director. "We were pleased when Commissioner Carr visited us during our Washington, D.C., Fly-In this year to discuss how the FCC is bringing broadband to rural America — and even more surprised when he asked to see the benefits of that fast, reliable access in action!" "Livestock auctions are increasingly using video sale services as a way to expand their audience and livestream to a whole new pool of potential bidders," Biondo said. "Not only does this improve business, it has allowed for increased access to real-time market information and resources for potential customers and young producers, without having to drive hours to reach the auction site." "My travels have given me a first-hand sense of the challenges that come with broadband deployment, and this has helped shape policies that can reduce costs and cover the regulatory fees for big cities to effectively deploy broadband to rural areas," Carr said. "In 2019, we will continue our work of spreading broadband deployment to every rural area through regulatory relief and regulatory reform." "Compton is four hours away from the closest Apple store; this rural community, and others just like it, deserve a fair shot at broadband connectivity. Big cities will always get next generation connectivity, but for these rural areas, regulatory reform will help relieve the costs of deployment to give everyone a chance for the opportunities that come with high speed service." "Remote access to quality health care is really important for farming communities," he said. "Rural clinics and hospitals are shutting down by the dozens, and one way to close that gap is through telehealth services. Take, for example, Avera Ecare in Sioux Falls, S.D. This one facility houses many health care experts, and from that single location and a broadband connection, they can plug into brick and mortar health care facilities across the country. This allows these small community health care providers to leverage their expertise to participate in the delivery of care." "The U.S. leads the world in 4G LTE, which is the gold standard in what's currently deployed," Carr said. "As a result of that, the U.S. has also become the technology and innovation hub of the world. Now we are in the transition to 5G, which is a better, faster version of what's available to folks right now. The U.S. is in a global race to 5G, and at the federal level we are taking steps to be competitive with South Korea and China in that race. We can do that by building small, backpack-size antennas, but we'll need hundreds of thousands of those to deploy the 5G service. By cutting down the regulatory tape, we can bring this to fruition." Of course, the United States is demographically much different than other urban, densely populated countries. Carr said this becomes a challenge for connecting every person across the country.